• High microbiological quality of effluent water resulting from the high removal efficiency of suspended solids, microorganisms and viruses. • Greater freedom to vary process parameters, like the reduction of excess sludge or the concentration of slowly growing organisms because MBR systems are independent on the sedimentation behavior of sludge. • Volume reduction of the activated sludge tank because of higher biomass concentration and elimination of the sedimentation tank, both resulting in a reduction of the total plant footprint (Coté and Liu 2003). The financial success of MBR is largely determined by the processes used to restore decreased flux caused by fouling. The resulting disadvantages of MBR are the high investment cost for the needed membrane surface area and/or high operating costs for cleaning management and the energy demand for cross-flow mode on top of the cost for supplying oxygen to microorganisms (Choi 2005; DWA 2005). The discharge of harmful substances, like endocrine-disrupting substances (EDS) into municipal and industrial wastewater and their passage through WWTP has also been investigated (Filali-Meknassi et al. 2004). Reverse osmosis and nano-filtration processes are able to reject EDS (Fig. 12.1), but sorption was found to be the main elimination process in sewage and industrial wastewater treatment, hence the elimination efficiency was high for MBR (Kunst 2002; Gallenkemper et al. 2003; Schäfer et al. 2003; Oschmann et al. 2005). Recently, submerged membranes have been applied in large-scale activated sludge plants more and more often because of the economical advantages of low pressure processes. By 2004, several commercial municipal WWTP in Germany had been built with submerged MBR systems for more than 100000 inhabitants; and common permeate fluxes are 8-30 L (m2 h)-1. The percentage of submerged systems is still increasing, evidently for small-scale systems (Bischof et al. 2005; Brinkmeyer et al. 2005). Figure 12.10 gives an overview of the membrane filtration process in comparison with conventional wastewater treatment. In cross-flow mode (Fig. 12.10c), the higher operational pressure of about 3 bar is provided by pressure pumps and a loop or recycling stream is used to increase shear at the membrane surface to attain high fluxes (e.g. BIOMEMBRAT used in activated sludge plants of food industries). Air bubbling and periodic back-flushing is possible. To date, no application of cross-flow mode in municipal WWTPs has been realized. Fig. 12.10 MBR systems, external and submerged mode in comparison with a conventional activated sludge system. Table 12.7 Performance characteristic of conventional activated sludge process and MBR (Gunder 1999; ATV-DVWK 2000b; Cornel et al. 2001; Côté and Liu 2003; MUNLV 2003). In the submerged mode (Fig. 12.10d), the membrane modules are directly installed in the activated sludge bioreactor or immersed in an aerated separate container (e.g. ZeeWeed-Cassettes; Cornel et al. 2001). Air bubbling plays a significant role in attaining high fluxes (Section 12.4.3) and periodic back-flushing is used to reduce fouling. The retention efficiency of the separation process is not influenced by gas bubbles, floating sludge or bulky flocs with lower density. Performance characteristics of MBR systems are given in Table 12.7 in comparison with conventional WWTP. 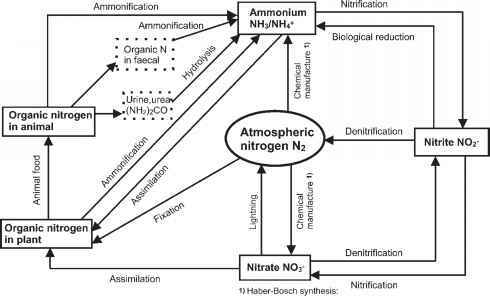 The minimum solid retention time with nitrification is 15 d for both systems, according to ATV-DVWK (2000a). 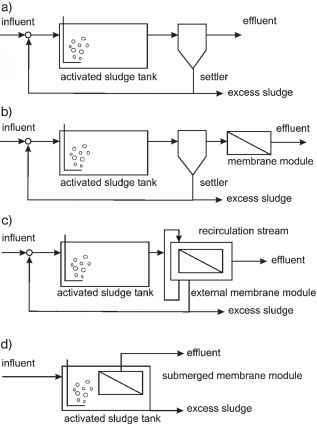 In the case of a MBR, the retention time of the sludge is unaffected by sedimentation behavior (Fig. 12.10c, d) and very high sludge ages (see Section 6.2.3) can be reached; but for municipal WWTP sludge ages of 15 d and sludge concentration of 8-16 g L-1 MLSS are common (Table 12.8). Activated sludge with such high concentration exhibits non-Newtonian behavior, the apparent viscosity is a function of g L-1 MLSS as well as shear gradient and affects both oxygen mass transfer and the degree of mixing (Rosenberger 2003; Kubin 2004; Choi 2005). The relative oxygen transfer ratio a„ (see Eq. 5.12) for different WWTP under operational conditions is found to be in the range of 0.25 to 0.8 for X and the range of 1-17 g L-1 MLSS (Cornel et al. 2001; Drews and Kraume 2005; DWA 2005). Removal efficiency rises with increasing MLSS concentration, but a maximum removal of 96-97% cannot be exceeded. COD removal efficiency was summarized by Kubin (2004) and Drews and Kraume (2005). Table 12.8 Membrane bioreactors in municipal wastewater treatment plants, submerged mode (Engelhardt 2003; Stein 2003; Voßenkaul et al. 2003; MUNLV 2003; Wozniak 2003; De Wilde et al. 2005; Roest et al. 2005; Rondi and Montagnoli 2005). ther applications. For example, in WWTP Markranstädt (Stein 2003) the hollow fiber membrane filtration modules are located in the upper part of the nitrification tank. Mixing units are installed together with aeration to reduce fouling. An ex situ cleaning shaft located between the nitrification lines is in place to take up the modules for the cleaning procedures. Another concept is followed with separated membrane filtration containers in WWTP Büchel (Wozniak 2003) and WWTP Rödingen (Engelhardt 2003). These filtration containers are aerated and the wastewater is recycled between the nitrification and denitrification tanks and the filtration containers, where nitrification also takes place. Experience with the WWTPs mentioned above has shown the importance of an intensive pre-treatment of wastewater by filtration. To reduce membrane fouling by the deposit of particles, it is necessary to perform additional pre-treatment of wastewater with a grid or a sieve <1 mm (Engelhardt 2003; Stein 2003; DWA 2005). Especially the fibrous components of the untreated wastewater leave deposits in the upper part of hollow fiber modules. The costs associated with MBR systems operating in cross-flow and submerged mode have been analyzed by Melin and Rautenbach (2004), who showed in estimated overall operating cost of 0.57 € m-3 for cross-flow mode and 0.56 € m-3 for submerged mode in sewage WWTP at small scales with volume rates of 100 m3 h-1. Overall operational costs for existing MBRs in wastewater treatment in the food industries were found to be 0.90 € m-3 (Wienands and Streif 2005), while the highest costs of cross-flow mode come from the energy consumption and the highest costs for submerged mode result from the investment in the membrane. The energy consumption of submerged systems has been measured between 0.8 kWh m-3 and 4 kWh m-3. Optimization of the aeration management leads to a reduction of energy consumption by about 35% and a consumption of less than 1 kWh m-3 has been predicted (Engelhardt 2003).